I saw the Google doodle on Tuesday and wondered who the figure was, and why he was wearing a clerical collar. It turns out that this is a pleasant caricature of a Belgian Jesuit priest named Georges Lemaitre, and the occasion was his 124th birthday. Actually Lamaitre has been dead for half a century but in the 1920's this priest and professor of physics and astronomer proposed what is often called the Big Bang -- the theory, not the sitcom. The term Big Bang was offered by an astrophysicist as a derisive dismissal of the notion of a constantly expanding universe. Lamaitre originated the theory and it was supported soon afterward by Edwin Hubble. 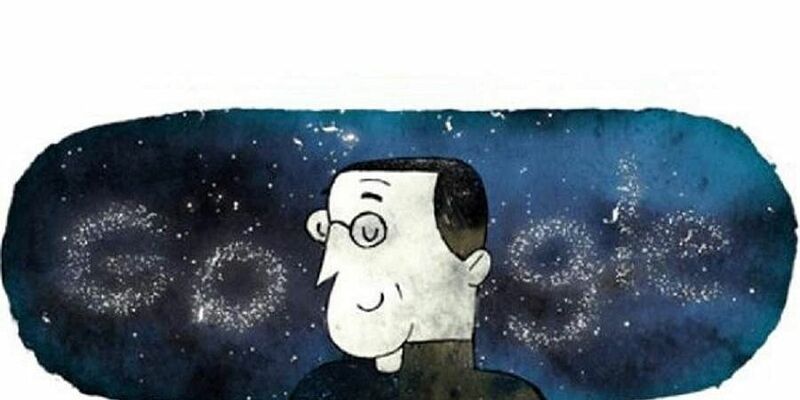 Lemaitre was also the first to derive what is now known as 'Hubble's law' and also derived the first estimation of what is now called the 'Hubble constant'. It was published in 1927, two years before Hubble's article. So often fundamentalist Christians have squared off against scientists, some of whom are fundamentalists in their own right, and the result isn't pretty. The assumption of many people who aren't part of faith communities is that all Christians are anti-science. Even though the church of another era persecuted scientists at times, there was also support for scientific developments and endeavours. In case you're wondering how Lamaitre was regarded by church officials, he was elected a member of the Pontifical Academy of Sciences in 1936, and took an active role there, serving as its president from March 1960 until his death. In 1951, Pope Pius XII declared that Lemaître's theory provided a scientific validation for Catholicism. Lemaître resented the Pope's proclamation, stating that the theory was neutral and there was neither a connection nor a contradiction between his religion and his theory. Lemaître and Daniel O'Connell, the Pope's scientific advisor, persuaded the Pope not to mention Creationism publicly, and to stop making proclamations about cosmology. While a devout Roman Catholic, he opposed mixing science with religion, although he held that the two fields were not in conflict. I'm grateful to Google for introducing me to this Christian scientist whose work changed our understanding of the universe. Now I'll go turn on my television and watch The Big Bang Theory in reruns on any one of a dozen channels.